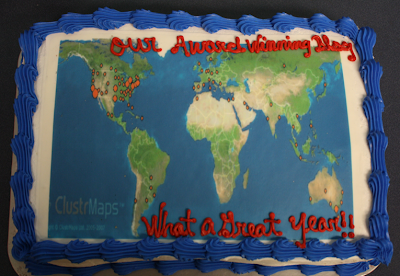 Yesterday, we had a big party to celebrate the end of the year! 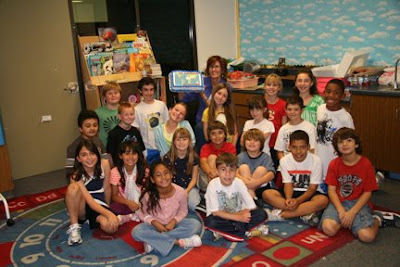 Our fabulous room moms, Mrs. Yumkas and Mrs. Kumar, put together a great party complete with the perfect cake! Comment Counters logged more than 500 comments! 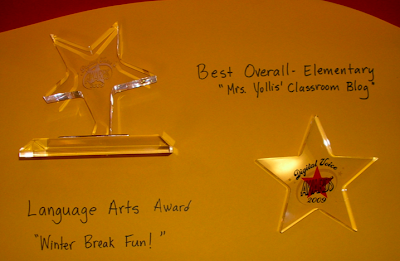 Goodbye to my third graders! 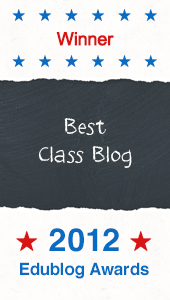 I know you'll do well in fourth grade! 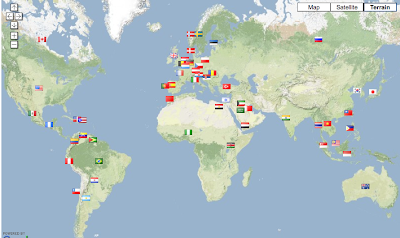 As we looked at the Flag Counter in our sidebar, we were excited to discover that we have visitors from SIX of the SEVEN continents. We had an excellent math/geography lesson using our visitor flags. First, we wrote the names of the visiting countries on slips of paper. 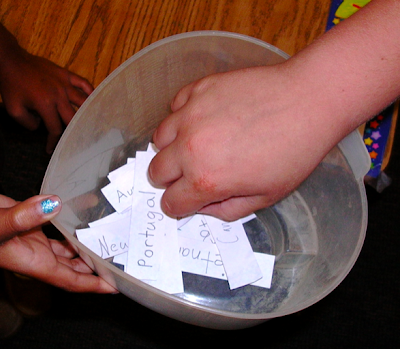 Then we each picked a country name. 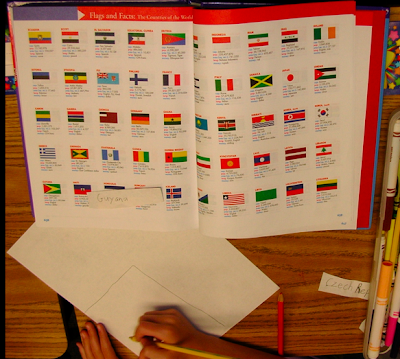 Next we went to the back of our dictionaries and looked for the flag so we could make one. Mrs. Yollis told us that thinking about fractions can be helpful when making a flag. We noticed that many flags were divided into third or fourths. Bahrain is one third white and two thirds red. 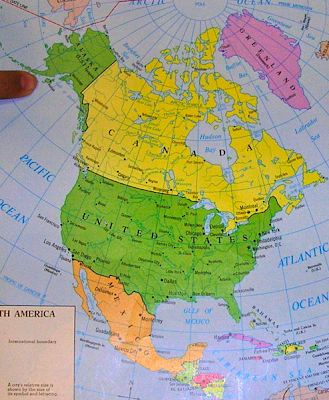 Canada was tricky to draw because of the maple leaf, but half of the flag is white and half of the flag is red. Italy's flag is divided into three equal parts. One third green, one third white, and one third red. Below is the color key we used for the continents. 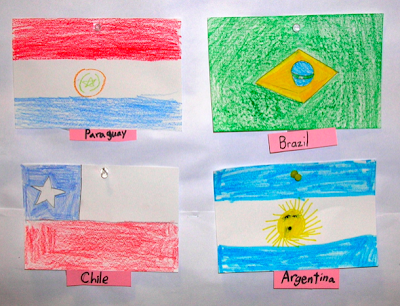 Here are some of the flags from our South American visitors. Paraguay's flag is divided into thirds. Brazil has the design in the center third of the solid flag. Chile's flag is tricky. The bottom three sixths (or half) are red, two sixths are white, and one sixth is blue. Argentina is divided into thirds. Two thirds are light blue and one third is white with a sun. 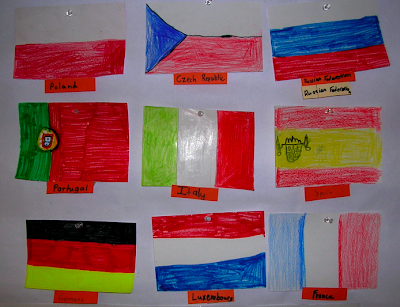 Below are some of the flags from Europe. Poland's is half red and half white. Czech Republic's is also half red and half white, but it has a blue triangle on the left. Portugal's is one third green and two thirds red. Germany's is split into thirds. One horizontal third is black, one third is red, and one third is yellow. Luxembourg's is also horizontal thirds, but one third is blue, one third is red, and one third is white. France's flag is divided into vertical thirds. One third is blue, one third is white and one third is red. Here are some of the flags from Africa. Egypt is divided into thirds, and Morocco is solid red with a star in the center. We have had visitors from MANY countries! 6 of our flags are from North America. 7 are from South America. 20 flags are from Europe. 17 flags are from Asia. 2 of our flags are from Australia. Thw WHOLE project was fun! Here is the bulletin board we created! Try this new interactive game: Guess the Flag! What did you learn from the flag making experience? Do you know who created our first public libraries? If you guessed Andrew Carnegie, you are correct. Andrew Carnegie was born on November 25, 1835, in Dunfermline, Scotland. Young Andy, as he was, called, moved to the United States with his family in Pittsburgh. A few years after the journey, Samuel Morse invented the telegraph. Around the age of twelve, Andrew got his first job as a telegraph messenger. As an adult, Andrew Carnegie was promoted to a telegraph officer. With the money he made, Andrew was soon able to buy a house. Later, he quit his job to explore other types of work and joined a train company that built their trains with beds so that passengers could rest on long trips. Later in his life, Andrew moved to New York and started the Carnegie Steel Company. He started the company when he learned that steel was much easier to use and get than iron. 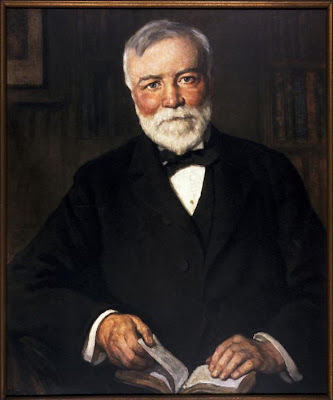 Carnegie began making a big profit. Further, in his life, Carnegie started the system of public libraries because he thought people should be more educated. I think that Andrew Carnegie changed the world because if there were no libraries, I may have never checked out the biography that I used to give you all this wonderful information. In addition, Andrew Carnegie libraries gave everyone the opportunity to read, even if they could not afford to buy a book. 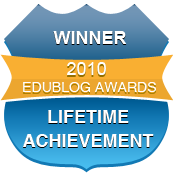 Here is a hyperlink to a time line of Carnegie's life. Below is a video presentation of my sculpture. 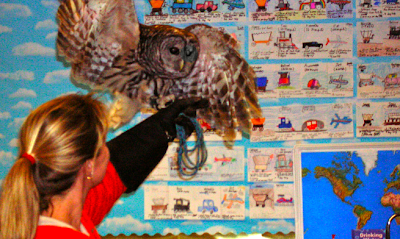 On Monday, Wildlife Experience came with two very exciting animals. First, came the red-tailed hawk. 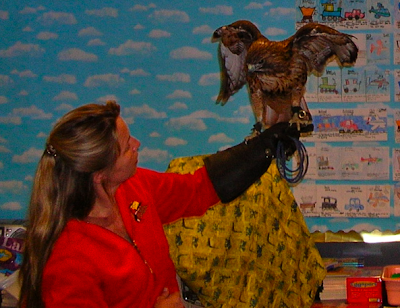 When the red-tailed hawk is born, it has a brown tail until it is one year old. When the bird grows, its tail feathers turn a rusty red color, and that’s how it got its name. Did you know that a hawk can see eight times better than our eyes? We can see the colors of the rainbow, but the red-tailed hawk can see in ultra-violet! That ability helps it see things that it wants to eat. Next, the Dumbo rat came out of its cage. The Dumbo rat got its name from its big ears. Did you know that rats can have 21 babies every 28 days? 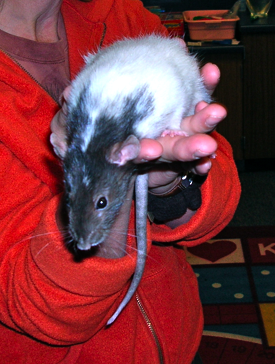 Rats usually lives up to 3 years, and they have a prehensile tail. That means a rat can use its tail to hang on. If you’re looking for a good pet, you might want to try the rat. It only costs $3.00 at the pet store, and a rat is capable of eating human food. Just don’t give the rat chocolate or candy! If you feel lonely while you’re doing your homework, put the rat on your shoulder and you don’t have to worry about it falling off. 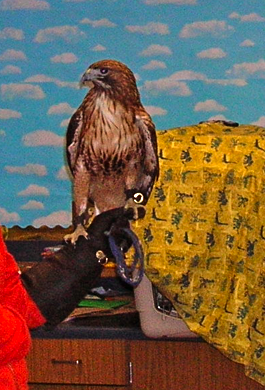 Do you have any new facts to add about the red-tailed hawk or the Dumbo rat? This year every class at our school got to go to the library once a week. Since school is almost over, we were not allowed to go to the library. To fix our problem, we created a lending library to help us have books to read. 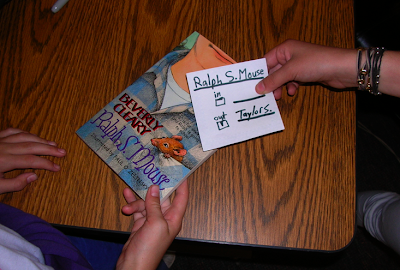 Many people in our class loaned a least ten books EACH! We made cards for the class to check out and check in. A lot of people brought Beverly Cleary and Matt Christopher books. A lending library really helped us keep up our reading! In Language Arts, we have been comparing and contrasting. First, we read each story. 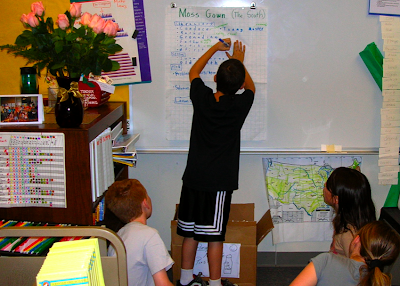 Next, in groups of five, we organized information about the main characters, the setting, and the plot on chart paper. We brainstormed high-level adjectives and verbs to describe the characters and setting. Finally, each group wrote a short summary of each folk tale. Notice the high-level vocabulary used in each retell. 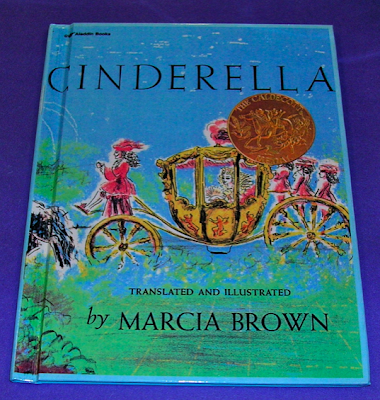 The book Cinderella, by Marcia Brown, is about a young lady who falls in love with a respectful prince. She has two crafty step-sisters who are jealous of her. In addition, she has a cruel step-mother who gives her exhausting chores. When her magical godmother arrives, she transforms a pumpkin into a mind boggling carriage and tiny mice into large horses. In a wink, Cinderella was at the fancy ball. There she met a benevolent prince. After that, she sprinted home because her courteous godmother told her to be home before midnight. While she was running, she lost one of her glass slippers, and the handsome prince found it. He had his finest men search the kingdom for the lovely lady who lost the shoe. Cinderella tried on the sparkling clear slipper, and it fit like a glove. They married and lived happily ever after. 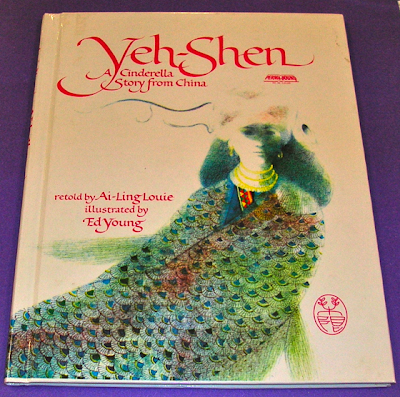 Yeh-shen, by Ai-Ling Louie, tells the story of a beautiful young girl known as Yeh-shen. She lived with a crafty step-mother and vain step-sister in a cave village in China. Yeh-shen had a magical fish and when her step-mother found out, she stabbed the fish with a sleek dagger. The fish bones became magical and Yeh-shen could made wishes with them. Knowing that, she wished for a wonderful azure dress to wear to the traditional festival and a pair of golden slippers. At the fun-filled festival, Yeh-shen lost her golden slipper when she fled the special event. A royal king found the tiny gold slipper and went looking for the glamorous woman who owned it. When he found out that the stunning slipper belong to Yeh-shen, he asked for her hand in marriage. The cruel step-mother and the bossy step-sister were not allowed to enter the castle and died in their cave in a shower of flying rocks. 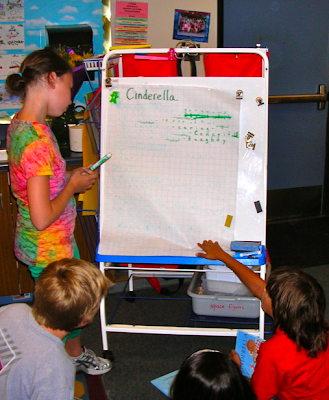 Yeh-shen is one of our favorite Cinderella stories because of the vocabulary and the superior characters. 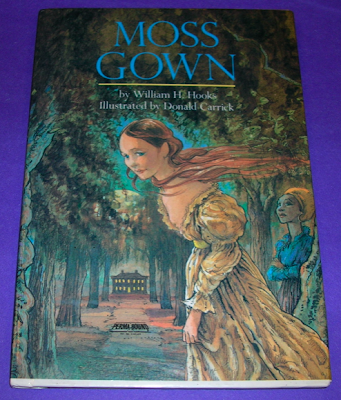 Candace, a young courageous heroine, was the main character in the story Moss Gown, by William H. Hooks. When Candace's wealthy father was dividing his land and money, he asked his daughters how much they loved him. When the two cruel sisters answered, they said, "I love you more than rubies, diamonds, and gold." Candace remarked, "I love you more than meat loves salt." The father gave the land and money to the two self-centered sisters and they kicked kind Candace out. She was crestfallen. Candace ran into the swampy woods and met a mysterious cat-eyed witch. The woman told her about a magic chant. The next morning, Candace knocked on a door of a plantation and met the bossy first cook. Then came the dazzling ball that the Young Master held, and poor Candace could not attend. The witch had given her a gown made of moss and when she chanted, she transformed into an elegant lady. When the respectful Young Master asked her to dance, Candace responded yes. At the end of the book, the elegant gown turned back into moss, but the Young Master didn't care. At the wedding party, Candace's father ate meat without salt, and understood what Candace meant. The wonderful prince loved Candace because she was intelligent and kind. They got married and lived happily ever after. 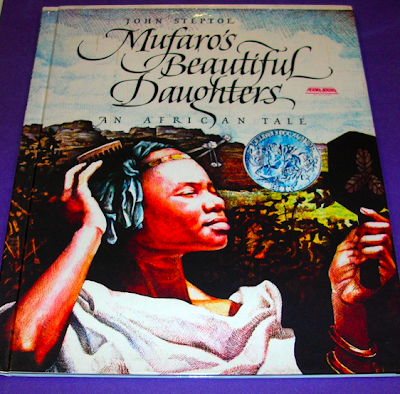 Mufaro’s Beautiful Daughters, by John Steptoe, took place in a marvelous jungle in Zimbabwe, Africa. This story was about two attractive sisters named Nyasha and Manyara who tried to become the exquisite queen. The king was a very magical shape-shifter. When he shape-shifted, he changed into living things like a starving child or a garden snake. The king was shape-shifting because he needed to find out who would make a better queen. He learned that Nyasha was benevolent, and that Manyara was malevolent. Finally, the king chose the congenial Nyasha and they lived happily ever after. In general, fairy tales have good and evil characters and some sort of magic. Usually the good character gets rewarded and the evil character gets taught a lesson. The moral of each story seems to be that you get what you deserve in life. We have also been learning about how to be a contributor to a group. Here are some ways to be a positive member of a project. Taylor G.: If a person is talking, do not interrupt. Jonah: Try to stay on topic. Even if there is something you really want to tell your friends in the group, try to concentrate on the group until recess. Taylor S. : When you are in a group and someone is doing something wrong, instead of saying, "You did this..." Use an "I" statement. For example, let's say a group was off topic. Say, "I feel that the group should get back on track." Clementine: Being too bossy or talkative is as bad as not doing anything or goofing off. Chloe: When you receive an "I" statement, you should listen. Sometimes people don't know they are not helping the group. Behyan: When you are in a group, you need to listen and participate. Amanda: If you have an idea and another person has an idea, look for a compromise. Lexi: If someone is not participating, ask them a question or ask for improvements to try and get them involved. Which Cinderella folk tale was your favorite and why? Compare and contrast the folktales. We'd love to hear your thoughts in the comments! Our Australian buddies at 2KM did a creative Voice Thread about the winter season that is beginning in the southern hemisphere. Since we live in the northern hemisphere, we did a creative Voice Thread about the summer season that is just beginning! 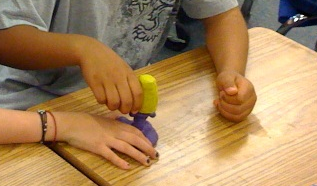 Like our buddies, we brainstormed things that you see, hear, feel, taste, and touch in the summer! Each student wrote a poem about Summer and shared a line from the poem in the Voice Thread. Thanks 2KM for the inspiration! Please enjoy our Summer Voice Thread! Click on the triangle to HEAR the poetry. What do you think of our Voice Thread? Which is your favorite season and what do you like to do during that season? Today was the big Concert on the Green with Mr. B., our wonderful music teacher. All grades performed a song. 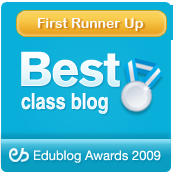 When we came back to our class, we recorded the song for our blog. Here is a presentation of our song, "Leaving on a Jet Plane" by John Denver. What was your favorite part of the Concert on the Green? How did like our song? Helen Keller is most known for being blind and deaf, yet she was very smart and didn’t let her disabilities get in her way. She was born in the small farm town of Tuscumbia, Alabama, on June 27, 1880. When she was 19 months old, she was struck with a high fever and was extremely ill. She lost both her sight and hearing abilities. In her early life, she acted like a wild animal because nobody taught her discipline or manners. 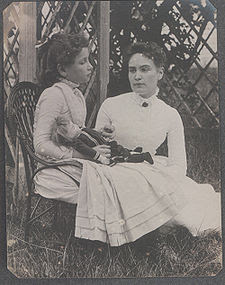 On March 3, 1887, her parents hired Anne Sullivan to teach Helen. Anne saw that Helen was very smart and a quick learner. She learned manual sign language in two weeks and soon was learning 30 words a day! In the fall of 1889, Helen went to The Perkins School for the Blind. Anne never left her side. Whenever someone talked, Anne translated for Helen. For example, if somebody said “Hello” to Helen, Anne would write it into Helen’s palm of her hand. In 1892, Helen learned to talk! She traveled to many places and met many famous people such as Alexander Graham Bell, Henry Ford, John D. Rockefeller, Woodrow Wilson, and Mark Twain. She was becoming famous herself. Helen was never afraid to do anything and never let her disabilities get in the way. She went snow sledding, horseback riding, ran into a wave at the beach, and even learned to ride a bicycle. In 1893, she decided she wanted to go to Radcliffe College. Her father had died and people raised money for her schooling. She had to go to a few other schools to prepare for Radcliffe. 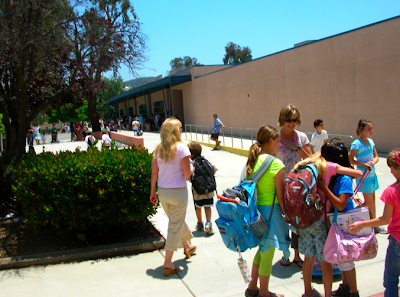 One school wanted to keep her for five years and tried to trick her mom to get guardianship of her instead of Anne. 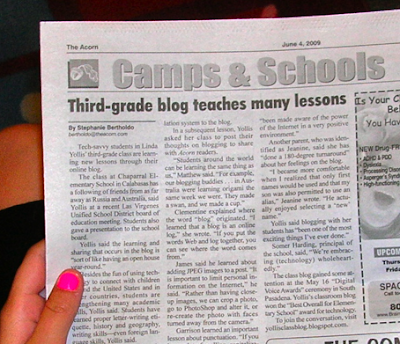 The school did this because Helen was famous and they wanted the money. Anne told Helen’s mother the true story, and they left that school. In 1900, Helen and Anne went to Radcliffe College. In 1902, Helen wrote her first book called, “The Story of My Life”. In 1904, Helen was the first blind and deaf person to receive a college degree. She graduated with honors. In her adulthood, Helen wanted to help others with disabilities. In 1905, Miss Keller started a career traveling, speaking and writing. In April of 1930, Anne became sick and couldn’t travel with Helen anymore. A woman named Polly Thompson took Anne’s place. Helen loved animals, especially dogs. In fact, the first Akita dog in the United States was sent to Helen from Japan in 1938. In January 1943, she visited disabled soldiers in the U.S. and in September 1964, President L. Johnson gave her the Presidential Medal of Freedom. She was given the title of “America’s First Lady of Courage.” She eventually visited 39 countries and met 12 U.S. presidents. She even won an Oscar for the documentary about her life called, “Helen Keller in Her Story.” On June 1, 1968, sadly, Helen Keller died in her sleep at age 87. I think that Helen Keller taught the world if you have a disability, don’t let it get in your way! 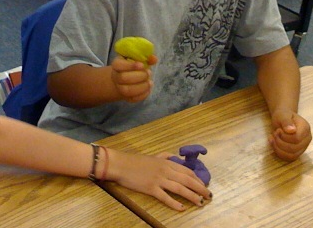 Here is a link to the Helen Keller Kids Museum Online. Below is a presentation of my sculpture. What did you learn that you did not know about Helen Keller? Being the first woman to fly across the Atlantic, Amelia Earhart changed history. She was born on July 24, 1897, in Atchison, Kansas. As a young girl, Amelia fished and played basketball with her sister. Her sister’s name was Muriel, but Amelia’s nickname for her was Pidge. Unfortunately, Amelia did not have a great young life. Her father was a lawyer and had to travel a lot. Because Amelia’s dad got several jobs, she lived in five different places! Imagine going to five different schools! But in any school, her favorite subjects were chemistry and physics. Even though she liked school, she never finished college. Since she did not finish college, she decided to become a nurse. When Amelia lost interest with being a nurse, she started taking flying lessons from Neta Snook who was one of the first women to fly. When Amelia grew up, she got married to George Palmer Putman. Amelia was already famous and used her fame to help women’s rights. Amelia started a group called the Ninety-Nines. She made this group to encourage women to be pilots. On July of 1937, Amelia and her navigator, Fred Noonan were trying complete a flight around the world. Sadly, Amelia and Fred was running low on gas and they crashed. No one knew what happened to them. Even though helicopters looked for them for 25,000 square miles, they were never found. I think Amelia Earhart changed history because she showed that women could do anything men could do. 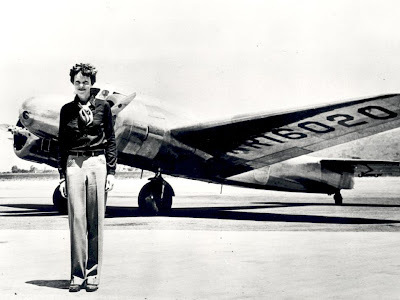 Here is a link to a Scholastic website about Amelia Earhart. Below is a presentation of my scupture! What do you think of Amelia Earhart? Do you know who drew and illustrated books about birds? If you guessed John James Audubon, you are correct. He was born on April 26, 1785, in Santo Domingo. When he was four, he moved from Santo Domingo to France. His real name was Fougere Audubon. His father was a French sea captain and a merchant. When he was about eight he discovered a love for birds, so he started painting pictures of them. Before he was 14, he already had hundreds of bird drawings. Sometimes he burned them if he didn’t think they were good enough. He was not a good student and often didn’t go to school. In fact, when he was 14 his father sent him away to study, but he hated it there. A year later, he went back to his home in France. When he was 17, he went to Paris to study art. He was so unhappy he left. When he left Paris, he changed his name to Jean Jacques Audubon. In 1803, he was sent to the United States to make something of himself at his father farm called Mill Grove. He changed his name to John James Audubon, which was an English word for his French name. He never stopped painting pictures of birds. In 1804, when he was 19 years old, he met a men named William Bakewell and fell in love with his daughter Lucy who he later married. Before he could marry her, he needed to get a job and make money. About a year later, he opened up a store to make money. Years later he got an idea to make a book about birds. He failed at making money and even went to prison because he could not pay his bills. He realized he needed to paint all the time. After many years, he finally got part of his book made, and he called it The Birds of America. Soon, his pictures were in the famous Academy of Natural Sciences and the Royal Institute in Liverpool. He was even made a Fellow of the Royal Society, witch meant he was one of the greatest scientists of the world. Lucy and John moved to England and he wrote more books. 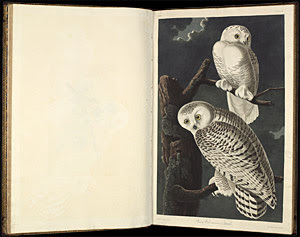 In 1838, The Birds of America book was finally finished. It had 435 pages and 1,065 pictures of birds. He moved back to the United States in 1839. He wrote more books about birds and other animals. He had two sons and he died in 1851, when he was 65 years old. A society was named after him called the Audubon Society. 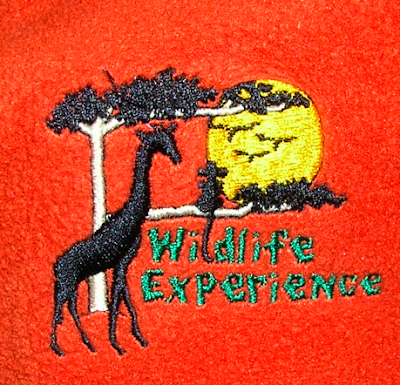 They helped conserve and restore things in nature, especially birds and other wildlife. If he did not draw birds, make books about birds, and discover birds they may not be so popular today. 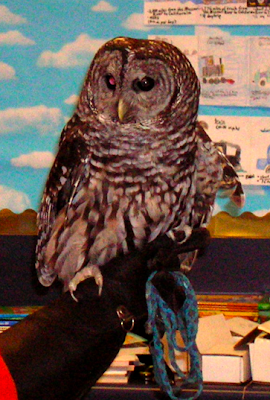 Here is a link to the local San Fernando Valley Audubon Society. What birds do you see in your backyard? 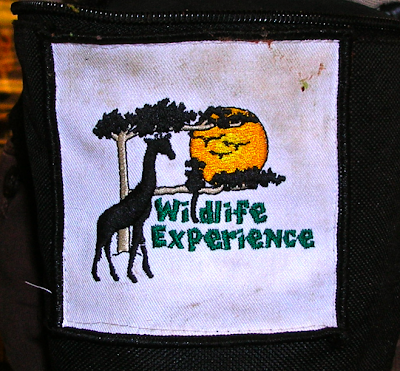 On Monday, Wildlife Experience returned with two amazing animals. First, we learned about footprints. You can figure out if an animal has been on a nature trail by looking at the footprints. 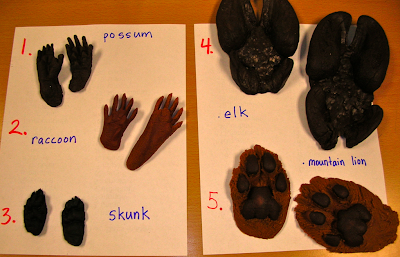 We got to hold rubber footprints from five different animals. Here is Awesome the Opossum! 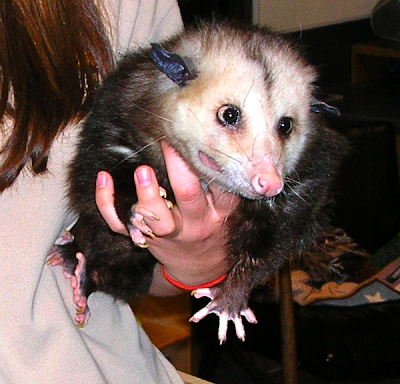 Opossums are the only marsupials that live in North America. A marsupial is an animal that lives on land and has a pouch. 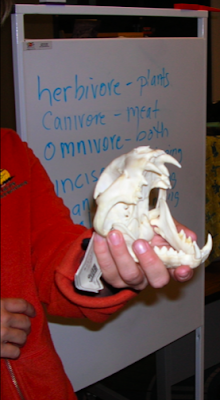 Awesome the Opossum has an amazing adaptation that she uses when she meets a predator. When an opossum is scared of something or someone, it tries to run away. If it can't outrun what is scaring it, then it will bare its 50 razor-sharp teeth and will snarl. If that doesn't work it goes into a catatonic state. That means a chemical is sent to the opossum's brain that makes it fall asleep, and it releases a scent that smells rotten. 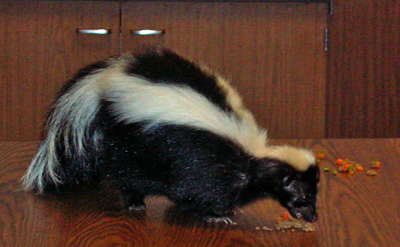 The dead smelly opossum is "playing dead" and that can save an opossum's life. Minutes later, the opossum wakes up, but does not know what happened. It did not even know it was playing dead! Wildlife Experience also brought a desert tortoise! These reptiles are an endangered species because some people take them out of the desert to keep as pets. Those people might have pets that have parasites which could spread to the tortoise. Sometimes, they return them back in the desert and that virus can spread to other tortoises. When that happens, sometimes a tortoise dies or it could get extremely ill! If that happens, the animal control could come and rescue the animal. That is what happened to the tortoise picture above. 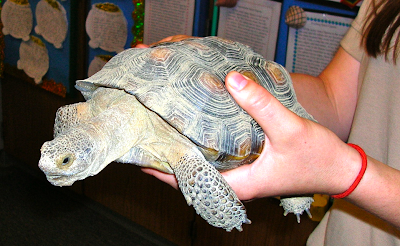 This tortoise no longer has the disease and is used for classroom events. Have you ever seen either of these animals in the wild? Have you ever played dead? When and why? A file box with folders is a great way to organize papers. I use this system, and you should try it too. First, I got a box. It is portable, and folders hang in it. Second, there are folders that can separate papers into different subjects. They hang from the black box. Last but not least, are the very important tabs. Their job is to let you know what is in each folder. For example, I have a tab for Math. Inside the Math folder are papers for the current chapter and papers I might need for the future. I even have sticky notes for upcoming tests! I can change or add tabs to my folders whenever I need to. 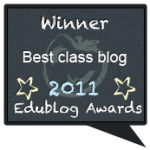 Overall, my folder system has been very helpful, and I know it will be helpful for upper grade levels. Do you think this system would work for you? 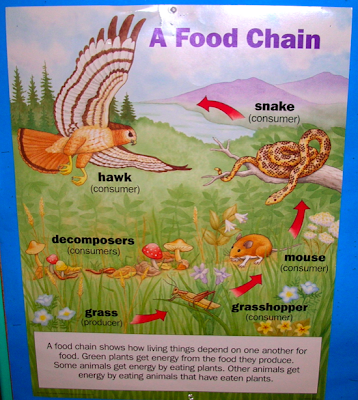 Our class has been studying animals and animal habitats. Mr. Yollis visited our class today to share the videos and photos he shot last summer on his trip to Kodiak, Alaska. Kodiak Island is the largest island in the Kodiak Archipelago, and is the second largest island in the United States. Transportation to rural areas in Alaska is done by float plane. Watch the video to see a float plane land on the ocean! Did you know that grizzly bears love water! Here is one looking under the water for salmon! Below is a video clip of a grizzly fishing for salmon at the bottom of a waterfall. Below is a video clip of a mother bear playing with her three cubs! 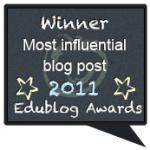 What did you learn about grizzly bears?